Background/Aim: The dramatic color change after iodine staining (from white-yellow to pink after 2–3 min), designated as the “pink-color sign” (PCS), is indicative of esophageal high-grade intraepithelial neoplasia (HGIN) or an invasive lesion. However, no study has yet examined the association between the time of PCS appearance and histopathology. We investigated the association between the time of PCS appearance and esophageal histopathology in 456 lesions of 438 patients who were examined for suspected esophageal cancer. Materials and Methods: The records of 495 consecutive patients who had suspected esophageal cancer based on gastroscopy and who underwent Lugol's chromoendoscopy from January 2015 to March 2018 were retrospectively reviewed. The time of PCS appearance was recorded in all patients, and tissue specimens were examined. Results: We examined 456 lesions in 438 patients. Use of PCS positivity at 2 min for the diagnosis of HGIN/invasive cancer had a sensitivity of 84.1%, a specificity of 72.7%, and an accuracy of 80.4%. We classified the PCS-positive patients in whom the time of PCS appearance was recorded (168 lesions) into 4 groups: 0–30, 31–60, 61–90, and 91–120 s. Based on a 60-s time for appearance of the PCS, the area under the receiver operating characteristic curve was 0.897, indicating good validity. At the optimal cutoff value of 60 s, the sensitivity was 90.2% and the specificity was 82.3%. The appearance of the PCS within 60 s had a diagnostic accordance rate of 88.6%, significantly higher than appearance of the PCS within 2 min (79.7%, P < 0.05). Conclusion: Appearance of the PCS within 1 min after iodine staining has a higher diagnostic accordance rate for esophageal HGIN/invasive cancer than appearance of the PCS at 2 min. Lugol's chromoendoscopy employs iodine staining, in which the initial yellow color changes to pink after 2–3 min, known as the pink-color sign (PCS). Previous research reported that the PCS had a sensitivity of 88% and a specificity of 95% in the diagnosis of high-grade intraepithelial neoplasia (HGIN) and invasive cancer. The PCS may form because of a disruption of the normal epithelial structure and early leakage of iodine. Since development of the PCS is an iodine-fading process, we hypothesized that the time required for development of the PCS may be associated with histopathology. Thus, we examined the relationship of the time needed for the PCS with a diagnosis of esophageal HGIN/invasive cancer. All patients, who were suspected of early-stage esophageal cancer and received Lugol's chromoendoscopy from January 2015 to March 2018 in the Fujian Provincial Hospital, were included. If a patient had multiple suspected lesions, each lesion was regarded as an independent lesion. The Ethics Committee of Fujian Provincial Hospital approved this study and all patients provided written informed consent before enrollment. Each patient received an upper gastrointestinal endoscopy. The esophageal mucosa was initially examined under white light for identification of any abnormal morphology or color. Any abnormality suspected of being an early-stage esophageal cancer was examined using Lugol's chromoendoscopy. For this procedure, one endoscopist sprayed 20 mL of a 1.0% Lugol's solution onto the upper esophagus to the esophagogastric junction and immediately began to observe color changes in the esophageal mucosa. At the same time, another endoscopist timed the development of the PCS using a stopwatch, for up to 2 min. When both endoscopists agreed on the presence of the PCS, the time was recorded. To decrease the duration of the procedure, and because iodine stimulates chest pain in some patients, a 1.0% Lugol's solution was used. Since use of a low concentration of Lugol's solution may accelerate development of the PCS, we adjusted the observation time to 2 min. Thus, a suspected lesion that turned pink within 2 min was identified as PCS-positive, and the time of PCS appearance was recorded [Figure 1]. After evaluation of iodine staining, biopsy, or endoscopic resection of suspected early esophageal cancer, specimens were collected for histological examination. All specimens were taken from a region with a PCS from patients who were PCS-positive, embedded in paraffin, and stained with hematoxylin and eosin. Cancer stage and histological grade were determined using the World Health Organization guidelines. The relationship between the time of PCS appearance and histopathology was determined in the PCS-positive group. If a patient had multiple suspected lesions, each lesion was classified as an independent lesion for statistical analysis. Patients were classified into four groups according to time of PCS appearance (0–30, 31–60, 61–90, and 91–120 s). Histological evaluation was used to classify patients as having inflammation/low-grade intraepithelial neoplasia (LGIN) or HGIN/invasive cancer. Factors associated with HGIN/invasive cancer were analyzed by logistic regression analysis. Adjusted odds ratios (aORs) and 95% confidence intervals (CIs) were calculated to describe associations between variables and histopathology. A P value below 0.05 was considered statistically significant. All statistical analyses were performed using SPSS software (version 19.0). We identified 521 lesions in 495 patients as suspected early-stage esophageal cancer from January 2015 to March 2018. In all cases, we administered Lugol's chromoendoscopy for histological diagnosis. Ten lesions in 8 patients were excluded because these patients previously received radiation therapy; 21 lesions in 19 patients were excluded because these patients previously received esophageal endoscopic submucosal dissection (ESD) or surgery, and 34 lesions in 30 patients were excluded because the endoscopy records had no descriptions or images of the PCS results. Finally, we included 456 lesions (87.5%) of 438 patients (88.5%) in the study. The pathological specimens were collected by biopsy (n = 221, 48.5%), endoscopic mucosal resection (n = 53, 11.6%), or ESD (n = 182, 40.0%). Among the 456 lesions, 287 (62.9%) were PCS-positive and 169 (37.1%) were PCS-negative. We diagnosed 244 of the 287 lesions (85.0%) in the PCS-positive group as HGIN/invasive cancer, and 46 of the 169 lesions (27.2%) in the PCS-negative group as HGIN/invasive cancer. The use of PCS positivity for the diagnosis of HGIN/invasive cancer had a sensitivity of 84.1% and a specificity of 72.7%. Further analysis of the PCS-positive group indicated that the time of PCS appearance after Lugol's staining was not recorded in 119 of 287 lesions (41.5%). Thus, we examined 168 lesions in 165 patients [Figure 2] and [Table 1]. We then classified these lesions into four groups, according to the time of PCS appearance (0–30, 31–60, 61–90, and 91–120 s). Fifty-nine of 60 lesions (98.3%) were diagnosed as HGIN/invasive cancer in the 0–30-s group, 62 of 67 lesions (92.5%) were diagnosed as HGIN/invasive cancer in the 31–60-s group, 11 of 29 lesions (37.9%) were diagnosed as HGIN/invasive cancer in the 61–90-s group, and 2 of 12 lesions (16.6%) were diagnosed as HGIN/invasive cancer in the 91–120-s group [Table 2]. Univariate analysis [Table 3] showed significant associations of histological diagnosis with age, circumferential extension, and time of PCS appearance. Multivariate analysis [Table 4] showed that the time of PCS appearance was significantly and independently associated with HGIN/invasive cancer (aOR = 10.2, 95% CI: 4.5–23.0). A Hosmer–Lemeshow test indicated that our multivariate model had sufficient goodness of fit (P = 0.043). 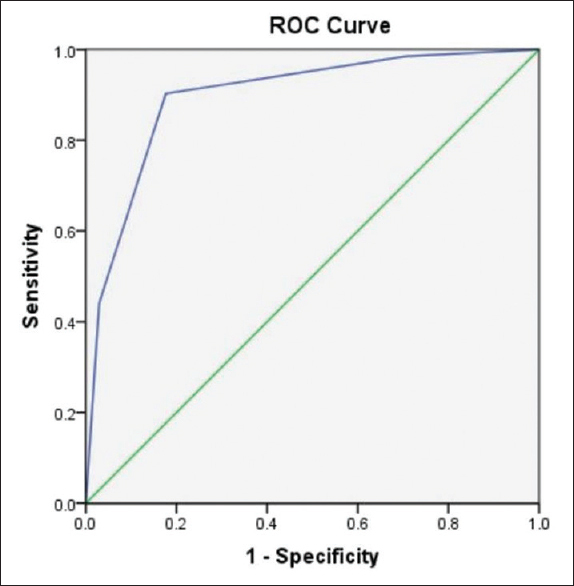 We used receiver operating characteristic analysis to identify the optimal cutoff value for the time of PCS appearance in the diagnosis of HGIN/invasive cancer [Figure 3]. The area under the curve was 0.897, indicating good validity. This analysis indicates that appearance of the PCS by 60 s provided a satisfactory accuracy for the diagnosis of HGIN/invasive cancer. Thus, we diagnosed 121 of 127 lesions with PCS times less than 60 s as HGIN/invasive cancer, and 13 of 41 lesions with PCS times more than 60 s as LGIN/inflammation. This corresponded to diagnostic accordance rate of 88.6% for HGIN/invasive cancer, better than use of the PCS at 2 min (79.7%, P < 0.05; [Table 5]). Our results showed that use of the PCS for diagnosis of HGIN/invasive cancer had a sensitivity of 84.1% and a specificity of 72.7%, somewhat lower than in previous studies (sensitivity: 80.5–97.9%, specificity: 88.2–95.0%).,, However, we used a lower concentration of the iodine solution than in these previous studies to reduce the incidence of adverse events. No previous reports have shown that use of a 1.0% Lugol's dye decreases the rate of PCS positivity. Additional studies in our center are also examining the use of different concentrations of the iodine solution on the rate of PCS positivity and the timing of PCS appearance. An advantage of the present study is that it had more cases than many previous reports, because our center is in an area of China with a high incidence of esophageal cancer. Several previous studies have examined the underlying mechanism of the PCS. It may be caused by early leakage of iodine into the esophageal lumen, because of an impaired epithelium. If so, it seems likely that a rapid appearance of the PCS is indicative of a highly disrupted epithelium. Our multivariate analysis indicated that the time of PCS appearance was significantly and independently associated with HGIN/invasive cancer. We also performed ROC analysis to determine the optimal PCS cutoff time for diagnosis of HGIN/invasive cancer. Use of a PCS cutoff time of 60 s provided a diagnostic accordance rate of 88.6% for HGIN/early esophageal carcinoma, better than that for a PCS cutoff time of 2 min (79.7%, P < 0.05). However, there is some subjectivity in identification of the PCS sign. Ishihara et al. performed a quantitative analysis of the characteristics of the color in the PCS. They confirmed the color change from yellow to pink using the L*, u* and v* color space, as defined by the International Commission on Illumination, and reported a sensitivity of 88% and a specificity of 95%. However, this quantitative analysis of color change increases the procedure time and requires a skilled endoscopist who can capture all images at similar distances and angles. Magnifying endoscopy with narrow-band imaging (ME-NBI) and Lugol's chromoendoscopy are the most common methods used to detect early esophageal cancer, and they have similar diagnostic accuracy. However, Lugol's chromoendoscopy requires an increased examination time and is associated with allergy to the iodine solution and chest pain in some patients. Especially, a higher concentration of Lugol's stain (3–5%) is associated with a higher risk of complications. However, Lugol's chromoendoscopy is commonly used in primary hospitals in developing countries, because it is readily available, affordable and efficient. Use of a low concentration of iodine may decrease the discomfort and examination time for patients and thereby reduce one of the disadvantages of Lugol's chromoendoscopy relative to ME-NBI. This study had some limitations. First, although each of the five experts had at least 10 years of experience in gastrointestinal endoscopy, they only evaluated and reviewed patient records from a single center in China. Further, large multicenter prospective studies are necessary to evaluate use of the time of PCS appearance with diagnosis of esophageal cancer. Second, only a single pathological specimen was taken from each biopsy, making the accuracy limited, and possibly leading to an underestimation of lesion pathology and depth of invasion.,, Third, when a patient has several unstained areas after spraying Lugol's solution, it is difficult to determine the earliest time of the PCS for all lesions. Fourth, the concentration of iodine solution may affect the timing of the PCS, so our conclusions are not applicable to other studies that employ Lugol's chromoendoscopy with different iodine concentrations. Because a high iodine concentration may increase the time of PCS appearance, a PCS appearing after 2–3 min in the iodine-unstained area may still require biopsy. Fifth, although Lugol's chromoendoscopy significantly improves diagnostic efficiency, it also increases the examination time by 3–5 min. In conclusion, Lugol's chromoendoscopy is a cost-effective tool that is widely used in developing countries that have high incidences of esophageal cancer. Our results indicate that appearance of the PCS within 1 min after iodine staining provides high accordance rate in the diagnosis of esophageal HGIN/invasive cancer. Yamashina T, Ishihara R, Nagai K, Matsuura N, Matsui F, Ito T, et al. Long-term outcome and metastatic risk after endoscopic resection of superficial esophageal squamous cell carcinoma. Am J Gastroenterol 2013;108:544-51. Ishihara R, Yamada T, Ishi H, Kato M, Yamamoto S, Yamamoto S, et al. Quantitative analysis of the color change after iodine staining for diagnosing esophageal high-grade intraepithelial neoplasia and invasive cancer. Gastrointest Endosc 2009;69:213-8. Fujishiro M, Kodashima S, Goto O, Ono S, Niimi K, Yamamichi N, et al. Endoscopic submucosal dissection of esophageal squamous cell neoplasms. Dig Endosc 2009;21:109-15. Mansour NM, Groth SS, Anandasabapathy S. Esophageal adenocarcinoma: Screening, surveillance, and management. Annu Rev Med 2017;68:213-27. Hashimoto CL, Iriya K, Baba ER, Navarro-Rodriguez T, Zerbini MC, Eisig JN, et al. Lugol's dye spray chromoendoscopy establishes early diagnosis of esophageal cancer in patients with primary head and neck cancer. Am J Gastroenterol 2005;100:275-82. Bloomfeld RS, Bridgers DI III, Pineau BC, Sensitivity of upper endoscopy in diagnosing esophageal cancer. Dysphagia 2005;20:278-82. Freitag CP, Barros SG, Kruel CD, Putten AC, Dietz J, Gruber AC, et al. Esophageal dysplasias are detected by endoscopy with Lugol in patients at risk for squamous cell carcinoma in southern Brazil. Dis Esophagus 1999;12:191-5. Shimizu Y, Omori T, Yokoyama A, Yoshida T, Hirota J, Ono Y, et al. Endoscopic diagnosis of early squamous neoplasia of the esophagus with iodine staining: High-grade intra-epithelial neoplasia turns pink within a few minutes. J Gastroenterol Hepatol 2008;23:546-50. Ishihara R, Kanzaki H, Iishi H, Nagai K, Matsui F, Yamashina T, et al. Pink-color sign in esophageal squamous neoplasia, and speculation regarding the underlying mechanism. World J Gastroenterol 2013;19:4300-8. Bosman F, Carneiro F, Hruban R, Theise ND. WHO Classification of Tumors of the Digestive System. Lyon: IARC Press; 2010. Pech O, Behrens A, May A, Nachbar L, Gossner L, Rabenstein T, et al. Long-term results and risk factor analysis for recurrence after curative endoscopic therapy in 349 patients with high-grade intraepithelial neoplasia and mucosal adenocarcinoma in Barrett's oesophagus. Gut 2008;57:1200-6. Ell C, May A, Pech O, Gossner L, Guenter E, Behrens A, et al. Curative endoscopic resection of early esophageal adeoncarcinomas (Barrett's cancer). Gastrointest Endosc 2007;65:3-10. Dubuc J, Legoux JL, Winnock M, Seyrig J, Barbier J, Barrioz T, et al. 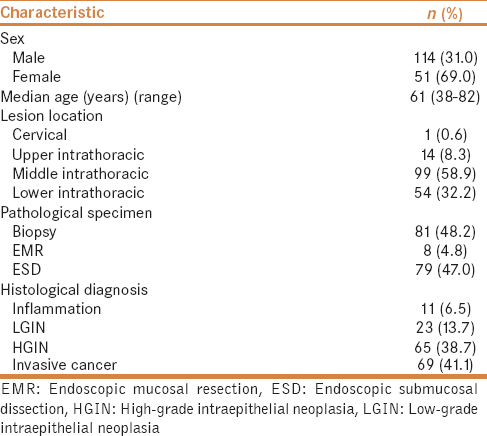 Endoscopic screening for esophageal squamous-cell carcinoma in high risk patients: A prospective study conducted in 62 French endoscopy centers. Endoscopy 2006;38:690-5. Dawsey SM, Fleischer DE, Wang GQ, Zhou B, Kidwell JA, Lu N, et al. Mucosal iodine staining improves endoscopic visualization of squamous dysplasia and squamous cell carcinoma of the esophagus in Linxian, China. Cancer 1998;83:220-31. Inoue H, Rey JF, Lightdale C. Lugol chromoendoscopy for esophageal squamous cell cancer. Endoscopy 2001;33:75-9. Sugimachi K, Kitamura K, Baba K, Ikebe M, Kuwano H. Endoscopic diagnosis of early carcinoma of the esophagus using Lugol's solution. Gastrointest Endosc 1992;38:657-61. Shimizu M, Nagata K, Yamaguchi H, Kita H. Squamous intraepithelial neoplasia of the esophagus: Past, present, and future. J Gastroenterol 2009;44:103-12. Rice TW, Ishwaran H, Blackstone EH, Hofstetter WL, Kelsen DP, Apperson-Hansen C. Recommendations for clinical staging (cTNM) of cancer of the esophagus and esophagogastric junction for the 8th edition AJCC/UICC staging 422 manuals. Dis Esophagus 2016;29:913-9. Rice TW, Ishwaran H, Hofstetter WL, Kelsen DP, Apperson-Hansen C, Blackstone EH, et al. Recommendations for pathologic staging (pTNM) of cancer of the esophagus and esophagogastric junction for the 8th edition AJCC/UICC 419 staging manuals. Dis Esophagus 2016;29:897-905. Goda K, Dobashi A, Yoshimura N, Kato M, Aihara H, Sumiyama K, et al. 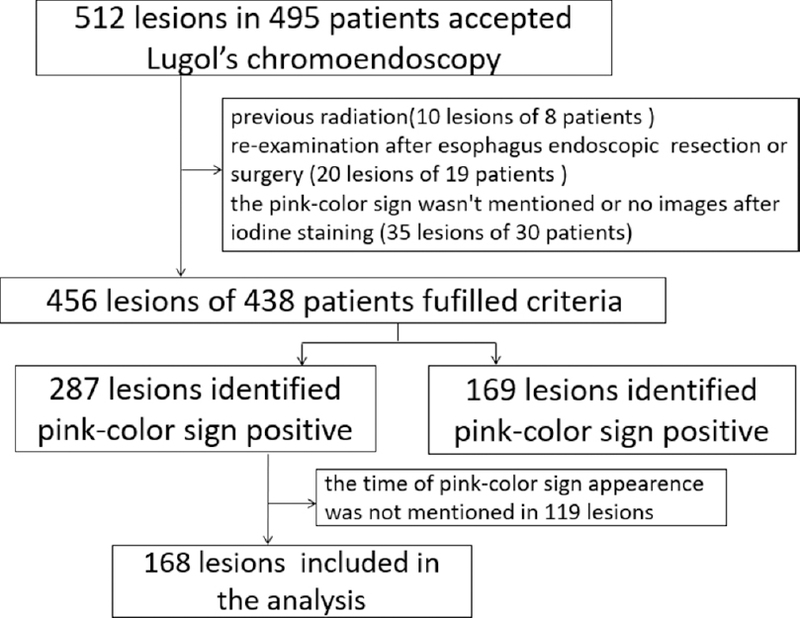 Narrow-band imaging magnifying endoscopy versus Lugol chromoendoscopy with pink-color sign assessment in the diagnosis of superficial esophageal squamous neoplasms: A randomized noninferiority trial. Gastroenterol Res Pract 2015; 2015. doi: 10.1155/2015/639462. Takahashi M, Shimizu Y, Ono M, Suzuki M, Omori S, Yoshida T, et al. Endoscopic diagnosis of early neoplasia of the esophagus with narrow band imaging: Correlations among background coloration and iodine staining findings. J Gastroenterol Hepatol 2014;29:762-8. Lin YS, Totsuka Y, He YT, Kikuchi S, Qiao YL, Ueda J, et al. Epidemiology of esophageal cancer in Japan and China. J Epidemiol 2013;23:233-42. Sreedharan A, Rembacken BJ, Rotimi O. Acute toxic gastric mucosal damage induced by Lugol's iodine spray during chromoendoscopy. Gut 2005;54:886-7. Lopes AB, Fagundes RB. Esophageal squamous cell carcinoma-precursor lesions and early diagnosis. World J Gastrointest Endosc 2012;4:9-16. Zhuang J, Wu HL, Wang H, Wang HJ, Chen ZS, Guo JQ, et al. 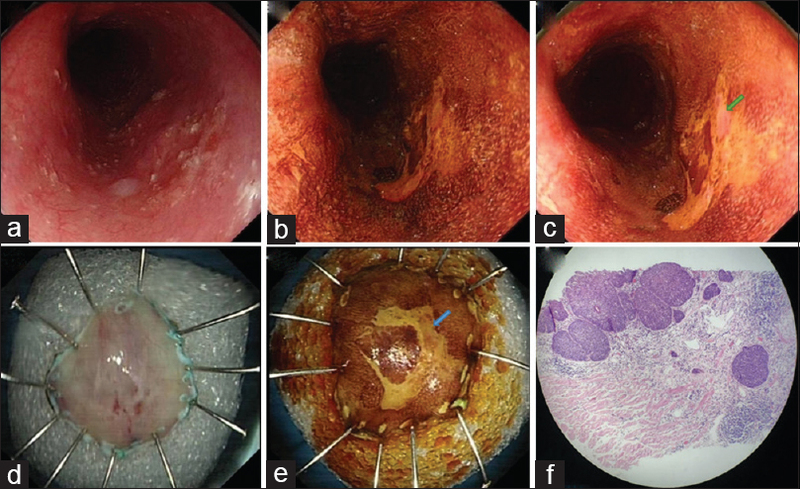 Clinicopathological analysis of endoscopic submucosal dissection for esophageal mucosa lesion. China J Endosc 2017;23:31-6. Shimizu Y, Kato M, Yamamoto J, Ono Y, Katsurada T, Ono S, et al. Histologic results of EMR for esophageal lesions diagnosed as high-grade intraepithelial squamous neoplasia by endoscopic biopsy. Gastrointest Endosc 2006;63:16-21. Muehldorfer SM, Stolte M, Martus P, Hahn EG, Ell C, Multicenter study group “Gastric Polyps”. Diagnostic accuracy of forceps biopsy versus polypectomy for gastric polyps: A prospective multicentre study. Gut 2002;50:465-70.